That says it all but they don’t really have the cash and we think Droga5, their AOR, is just too expensive. Get in there and give’s a good deal. Blue Apron has named chief financial officer Brad Dickerson as its new CEO, according to multiple sources. Dickerson replaces co-founder Matt Salzberg, who will stay on as executive chairman of the company. Dickerson, formerly CFO of Under Armour, joined Blue Apron in February 2016. Blue Apron has endured one setback after another since its underwhelming IPO this summer. The meal kit company has lost customers, seen production costs soar, and recently opened a New Jersey production facility that turned out to be too expensive. It reported a loss of $0.47 per share in its most recent quarter and has a valuation of $568 million — about a quarter of its highest value. Nothing has gone right for Blue Apron since its IPO filing this summer. The company debuted at nearly half the value it originally sought, and in the months that followed made numerous missteps as customers defected and costs ballooned. Its stock price has tumbled more than 70% since June. It’s clear something needed to change, and ousting Salzberg, the company’s co-founder and the one who has taken considerable heat for the company’s woes, is the most logical step. Brad Dickerson brings considerable executive experience to the role. For 11 years he worked for Under Armour, first as chief operating officer and then as chief financial officer, helping lead the athletic apparel company through some of its biggest growth years. He’ll face a considerable challenge at the helm of Blue Apron. There are numerous fires to put out, but the meal kit maker’s central challenge is controlling costs while also growing its customer base. It needs to spend money to attract users, though doing so diminishes its profitability. If it cuts back on marketing spend — as it did in its most recent quarter — it loses customers. 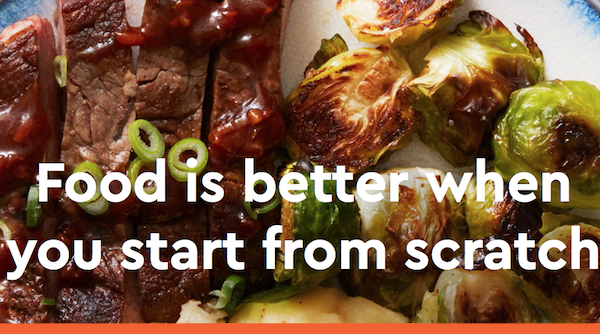 Blue Apron’s future is looking increasingly difficult as more grocery stores unveil their own meal kits and other competitors in the space — most notably its European rival HelloFresh, which just went public in Europe — increase their presence in the U.S. Albertsons bought meal kit pioneer Plated this fall, and should start rolling out offerings in stores by the end of this year. Then there’s e-commerce giant Amazon, which is currently testing its own meal kits. Despite its recent woes, Blue Apron does have assets upon which it can build. It remains the largest meal kit company in America. And while it has lost customers recently, it’s convincing regular customers to spend more money. Blue Apron desperately needs to break its chain of losses. If it continues to slide, it will need to sell — quite possibly to a grocery retailer like Walmart.